The first programme and pages of our website are concentrating on the North-West of Ireland: County Donegal to be more precise. There are about 450 angling waters in County Donegal. Ranging from big lakes and rivers to tiny streams and ponds. They can be situated just beside the road or hidden away and hard to find. The 137 waters shown on our DVD have all relatively easy access. So, we hope you will enjoy our little excursion into the Donegal countryside and that the information given helps you to find some great fishing. 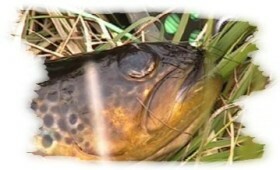 You will find more inspirations on where to fish in the DIARY section; even better: buy the DVD. Let's start our journey in Inishowen, the most northerly part of Co. Donegal. The largest town of the peninsula is Buncrana. Where you will find a good variety of shops, restaurants, pubs, Bed and Breakfast houses, as well as two hotels, two golf courses; a long sandy beach and historic buildings and ruins. And a salmon and sea trout river just outside of town. The Crana River is a 20 km spate river, coming right down from the Inishowen mountains to drain into Lough Swilly just north of Buncrana. Letterkenny, located at the south tip of Lough Swilly is Donegal's largest Town. And if you like to combine your fishing with the activities and entertainments a big town has to offer, then this is the place for you. Theatre, cinemas, shopping centres, night clubs, bars, leisure centres, golf course, museums and of course a wide choice of hotels, B and Bs and guesthouses. As well as the Swilly, a spate river with its mouth just east of the town. It gets runs of salmon and sea trout from mid June onwards. Plenty of rivers and lakes are only a short drive away. The most Famous of these waters would be Lough Fern with the Lennon River. In contrast to the hustle and bustle of Letterkenny and its busy nightlife the Fanad peninsula offers a more gentle pace of life. Ballymastocker Bay and its beautiful beach with wild Donegal landscapes of Fanad Head: The attraction for may people to come here and spend their holidays. There are B and Bs which have a room with a view, self catering houses and a caravan and camping park near the beach, for those who want to be even closer to nature. Of course there is fishing as well, the Fanad Head Lakes are known for their good wild brown trout. 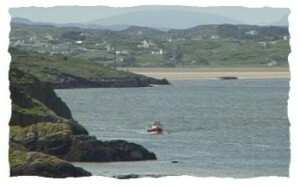 On the shores of a sandy inlet, called Sheep Haven Bay lies Dunfanaghy. This lively village with its galleries, arts centre, craft shops, coffee houses, night club, golf course and horse riding facilities offers accommodation ranging from three star hotel to hostel. To the north of the village lies the rocky bulk of Horn Head. From here you have a magnificent overview of the area with its sandy beaches and many archaeological sites. And, a few of the region's lakes. 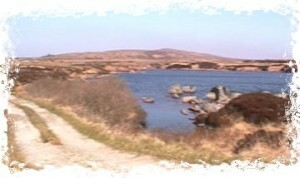 On the outskirts of Dunfanaghy, along the N56, we find New Lake. It came into existence in 1917, after a three day storm dislodged dune sand and silted up the old harbour. What was once farmland is now this shallow lake. The area is a nature reserve and fishing is from the boat only. Bunbeg and Derrybeg are two towns in Gweedore lying side by side. We are in the middle of a Gealtacht area and besides English the language spoken here is Gaeilge, which has survived along with other age old traditions. On the other hand, Bunbeg and Derrybeg offer the visitor all mod cons. There are hotels and guesthouses, shops and bars. You can take a boat trip to Tory Island or pleasurcruise through the archipelago along the Gweedore coastline. And of course there is a golf course. Only a couple of minutes drive from Derrybeg towards Bloody Foreland on the R257 you will find Lough Aninver alongside the road. The Rosses is an area blessed with water. There are over one hundred and thirty lakes concentrated here. Most of them are connected by three main rivers, the Crolly, the Owenamarve and the Dungloe. Dungloe can be regarded as the capitol of the Rosses. The town is built where the little Dungloe River enters the sea. There are banks, hotels, a leisure centre, restaurants, bars and a variety of shops. Horse riding is available and it seems that wherever you go in Ireland there is a golf course. Our excursion into the Rosses fishery can start right here at Dungloe Bridge in Bonner's fishing tackle shop, where you will get all the information on angling in the area you require. The little Dungloe River runs through a couple of lakes before it enters the sea. Though it seems very small, the deep pools hold sea trout in the summer months. The busy twin towns of Ballybofey and Stranorlar are separated by the Finn, Donegal's biggest river. The two commercial towns offer the visitor a lot of entertainment, conveniences and activities apart from fishing. Theatre, shops, restaurants and the obligatory 18 hole golf course, right beside a nice little trout lake, called Lough Alaan. There are good hotels here, one is beside the river and on the right day, from your room or the garden restaurant, you can actually see the fish leaping. An Afternoon at Lough Finn, Co. Donegal, Ireland. It is very tempting to stay here all day, but let's go and follow the Finn River from it's beginnings. That is what we are here for. Ardara lies by the sea, surrounded and sheltered by mountains on three sides. There is a hotel in town, a couple of restaurants, pubs with music and craic. The golf links are a 15 min. drive from the town at Narin. Ardara is famous for its tweed and wool manufacture. Often you can buy the product straight from the factory shop. There is a good pool for salmon and sea trout right in the town, where the Owentocker runs into LoughrosBeg Bay. Leaving Ardara in an easterly direction for Glenties on the N56, the road follows the Owentocker River up. It is very spatey and has few pools, but the brown trout fishing can be great fun. In summer and autumn there is always a chance for sea trout or even a salmon. A few kilometres further down the N56 is Glenties. At the Angling Centre here tickets and information on one of Donegal's best salmon rivers are available. The Owenea, coming down from Lough Ea drains the northern slopes of the Blue Stack Mountains. Carrick, the little town at the foot of Slieve League is the gateway to Bunglass, the highest sea cliffs in Europe. This is a good centre to explore the fishing waters belonging to the Glen River system. Accommodation ranges from Hostel to Bed and Breakfast and the Hotel near Glencolumbcille. Whatever you choose, fishing is never far away. Leaving Carrick on the R263 for Glencolumbcille, you will drive along the Owenwee, or Yellow River. There are stiles along the banks and pools which hold salmon and sea trout from July on. It is always worth a try in August and September when in spate. Historic sites, a craft village, tweed factories and night clubs, all make Donegal Town an attractive place to stay. By the way, the golf course is just outside town at Murvagh. 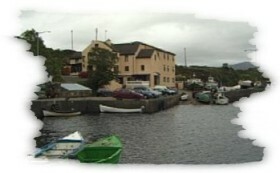 Donegal Town is a busy little market place, right on the eastern tip of Donegal Bay. The town is the commercial focus of the area and can be regarded as one of the Irish tweed centres. To find the right accommodation in Donegal Town should not be a problem, there are several hotels with leisure centres, a range of B and Bs, hostels and guesthouses. The Eske, a trout and Salmon River, runs right through the middle of town. Moving west on the N56 we come to Mountcharles with St. Peter's and Glencoagh Lakes. Ballyshannon at he mouth of the River Erne is, because of its geographical position and border proximity, the gateway to County Donegal. The town with its natural harbour and picturesque views of the Erne Estuary offers accommodation off all varieties, from hotels to self-catering and B and B. 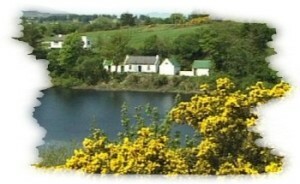 A caravan park is just outside town on the banks of the Assaroe Reservoir. There is a shopping centre, an indoor swimming pool, many shops, cinemas and theatre. The town and surroundings have good restaurants and bars. The golf links are just a couple of kilometres to the southwest at Bundoran. 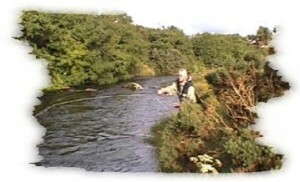 Around Ballyshannon you can find the only coarse angling waters of county Donegal. In a triangle between Ballyshannon, Laghey, Pettigo there are some thirty lakes. Most of them hold a fair stock of Pike and Perch. There is a favourite angling spot right here in the middle of Ballyshannon, the Mall Quay: ideal for fishing the Erne Estuary for sea trout, eel and slob trout. The entire estuary, from the town down to the open Atlantic, is in fact a very good fishery. Best times are from April to the end of August. There are a couple of access points along the estuary. Easiest is off the Abbey Road, running along the northern side.